Previously, in part 1, we looked at the theory of both ML-agents deep learning algorithms and evolutionary computation. Now it’s time for us to implement the whole thing. First, let’s start by making a creature! The creature we’re going to train will be designed in 2D environment, for the sake of simplicity. On the image below, you can see the creature in Unity’s scene. It has a body and 2 legs, where each of them consists of 2 parts. The leg parts are connected to each other and to the body using HingeJoint2D. Each HingeJoint2D has angle limits. 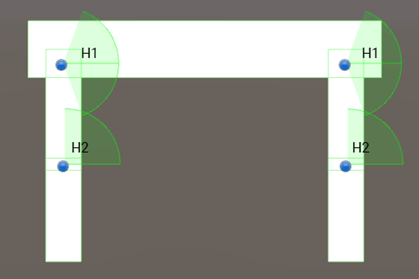 Below you can see joints setup and configuration of angle limits for both types of joints: H1 & H2. Well, that’s pretty much it. The creature is done. Easy, isn’t it? Now let’s move onto coding the AI. So, the first next thing for us to do in the scene is to add an Academy and a Brain. To create an Academy, we should write a simple script. For our task, it’s really simple. Name the script WalkerAcademy and inherit ML-Agent’s class Academy. That’s it. Academy has a couple of basic methods, buy we don’t need them in this project, so you can leave them empty. Create a WalkerAcademy object on the scene and add WalkerAcademy spript as a component to it. To add a Brain, create an object called WalkerBrain on the scene and parent it to the WalkerAcademy. Now, add a Brain script to it. Below you can see the scene setup we have at this point. Configuring the Agent is also easy. Create a script WalkerAgentConfigurable which inherits Agent class from ML-Agents library. WalkerAgentConfigurable can override methods called CollectObservations() and AgentAction() which correspond to collecting observations and assigning actions respectively. Limbs parameter is a public array that contains references to the legs’ limbs. Leg_touching is an array which holds a bool value whether the leg is touching the ground or not. Actions control movement of legs by applying torque to them. There’s only 4 actions coming from the Brain to our Agent. Each Action is a float value between -1 and 1. Each of those actions is multiplied by strength parameter. That’s it with the ML-Agents setup. It’s very easy and rapid. Now let’s look at the Evolutionary Algorithm. As I mentioned previously, this method was proposed by Alan Zucconi in his series of blogposts about Evolutionary Computation. If you’re interested in implementing genetic algorithm for this task, I’d recommend you read his blog where he explains the whole logic behind it and links the project in the end. Here, I’ll just mention some adjustments that were made to improve his project. Our sine wave is shaped by 4 parameters. Each parameter is a target to optimization. Here, p is a period, amplitude of sinusoid is ranged between M and m and o is an amount of shift on X axis. First of all, the creature and control methods are different, comparing to the Alan’s model. In his project he used DistanceJoint2D to control the leg movement of his creature. Our creature is controlled using torque applied to the limbs. Well, those are the major differences. In the next part we’ll take a look at the training process and the results themselves.